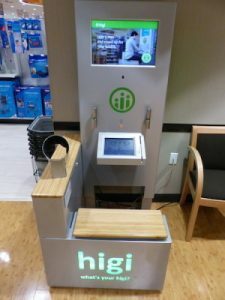 CHICAGO – higi, a consumer health technology company with over 10,000 smart health stations located in convenient locations nationwide, has a national network of self-service, smart health stations that are free and convenient for consumers. The network, located primarily in retail pharmacies, is coupled with a robust, interoperable, digital platform that empowers consumers to measure, track and act on their data. Providers, payers or employers can leverage this network to reach, activate, and engage its community members to collect and measure biometrics and other health and social determinant data. With 10,000 smart health stations and nearly 1 million sessions each week across the higi network, these trusted access points expand access to care and create a channel to activate and engage underserved and other hard to reach populations at scale. The creation of a 4th Network of Health care occurs when legacy health care networks and platforms offered by providers, payers and self-insured employers connect into the higi network and tap the power of the national health station footprint to connect to consumers where they live, work, and play. Partners can leverage survey and biometric screening data to intelligently connect consumers to the care and services that help meet the healthcare needs of the consumer and the population health goals of the partner. This combination of higi network connectivity, consumer access, real-time data intelligence and scalable remote digital engagement is the missing link addressing many of the foundational challenges and limitations of the healthcare ecosystem. The higi 4th Network of Health care leverages existing networks and workflows to deliver a solution that supports revenue generation, cost reduction and enables a pathway for earlier detection and prevention of health issues for healthier individuals and communities. higi is working with partners to close gaps in care, expand community access points, and make it easier for those with chronic conditions to stay engaged with their care providers. To further these efforts, higi is attending Health Information and Management Systems Society Conference (HIMSS) in Orlando from February 11–15 to expand this growing network that connect health care stakeholders with consumers. Learn more by visiting them at booth 7366 or by going to www.higi.com.